These fruity, nutty, fudge brownies will become your new go-to recipe. Preheat the oven to 350 °F (180 °C). Lightly grease an 8” baking pan and line it with parchment paper. Combine the prunes, dried cherries and coffee (or other liquid) in a small bowl. In a medium saucepan over low heat, melt 1 cup (250 mL) chocolate chips with the butter, stirring frequently until smooth. Cool to room temperature. Whisk the brown sugar, eggs and vanilla into the chocolate mixture. In a large bowl, stir together the ground flaxseed, cocoa, flour, baking powder and salt. Stir in the chocolate mixture, then add the dried fruit/coffee combo, nuts and remaining 1/2 cup (125 mL) chocolate chips. Mix well then scrape into the prepared pan. Sprinkle the whole flaxseed on top. 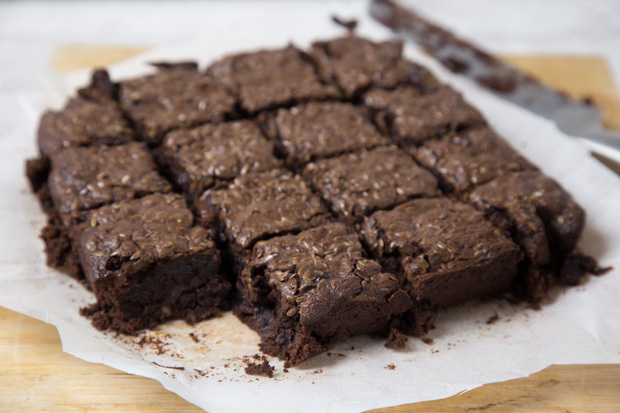 Bake the brownies for about 18-22 minutes, until a toothpick inserted in the centre has only a few crumbs clinging to it. Remove the pan from the oven and let cool on a wire rack before cutting. Serving Size: 1 brownie. Each serving contains 2 tsp (10 mL) of flax.